Joe was a student-athlete in a variety of sports throughout his high school and college career. In 1966, as a sophomore, he played varsity football and helped Tucson High win its second consecutive State Championship. In 1968, under Ollie Mayfield’s coaching, Tucson High made history by being the first team to be voted number one in the polls and not going to the playoffs. Joe earned All-City, All-State and All-American honors as a halfback and was voted Captain of the first team offense of the All-State team. In 1998, he was inducted into the Tucson High Badger (T club) Hall of Fame. Joe was also a three-year letterman in basketball under Coach Tony Morales. In his senior year, he was the sixth man on the State Championship basketball team. The team was ranked among the top high school basketball teams in the nation finishing with a record of 23-1. Joe played baseball under the coaching of Ray Adkins for two years, 1967 through 1969. He was All-City first team and All-State honorable mention as an outfielder. 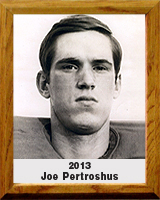 Joe played in both the baseball and football high school All-Star games, helping the South to win both games. He attended the University of Arizona on a football scholarship. He started his junior year and led the Wildcats in rushing. Due to injuries, Joe’s football career was shortened. Joe still holds Tucson High School football records that have not been broken through the 2012 football season.